Remember the older days when you had a collection of song, Now these days youth just use Music Streaming Apps. You have to use some MB form your data to enjoy any song anywhere you want. You don’t have to fill your storage you just need a good internet connection to enjoy any streaming app. 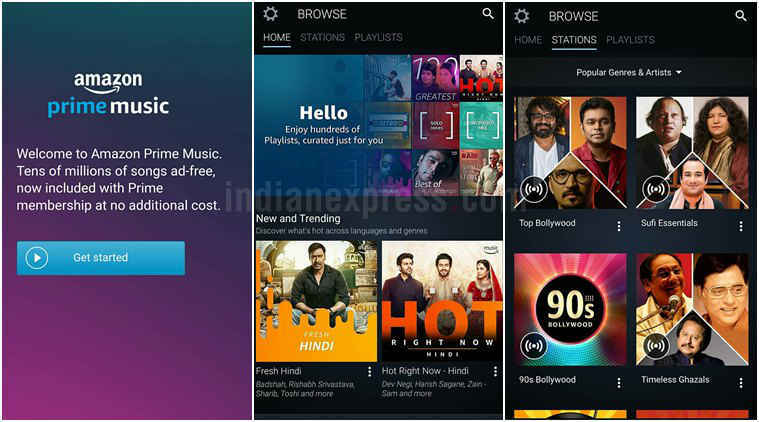 There are a lot of streaming music app to get is easier for you we have made a list of best free music streaming apps in India. Apple music is a music home for iPhone user also used by all other mobiles too. It provides over 30 million songs with a good sound quality. It covers all the genres like pop, rock, hip-hop, dance, jazz etc.The app even provides in-house curated playlists categorized by genre, artist and your mood. It also has a radio channel name Beast 1 that features radio shows from legendary artists and singers that you can listen to live or on-demand. The first three months are free and after that, you have to pay a sum of 120/month, 190/month family pack(6 members) and 60 rupees for the student for android user. For ios user the first three months user are also free but then you have to pay 9.99$ per user, 14.99 for family pack and 4.99 for student pack. The only disadvantage it has that it doesn’t have a free version like other streaming apps. Spotify is a giant in the music streaming app with 140 million active users (60 million paying user). It is the oldest music streaming app provides more than 30 million songs. It features playlist by moods, genres, artist, activity etc. You can search for any album or any single here. Spotify is free as well as payable as I already mentioned above, In the premium version you will get unlimited download and add free service. 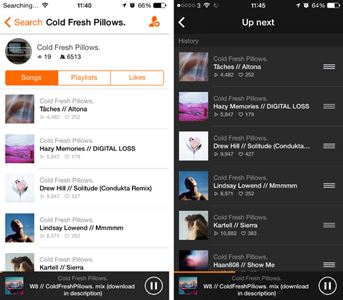 Soundcloud is big among all the music streaming app with a huge library of over 150 million songs. You can follow your favorite artist and any playlist. You can also like, share and comment on posts. Get suggestions based on your likes and listening habits. Create custom playlists for parties, workouts or based on your mood and share with your friends directly from the app. It is available for Android OS, iOS and desktop platforms. New users get the free first-month trial subscription and are chargeable at $4.99/month later for ad-free playback and offline using. Its also has a new service name SoundCloud Go+ for using this you have to pay a some of 9.99$ per month. 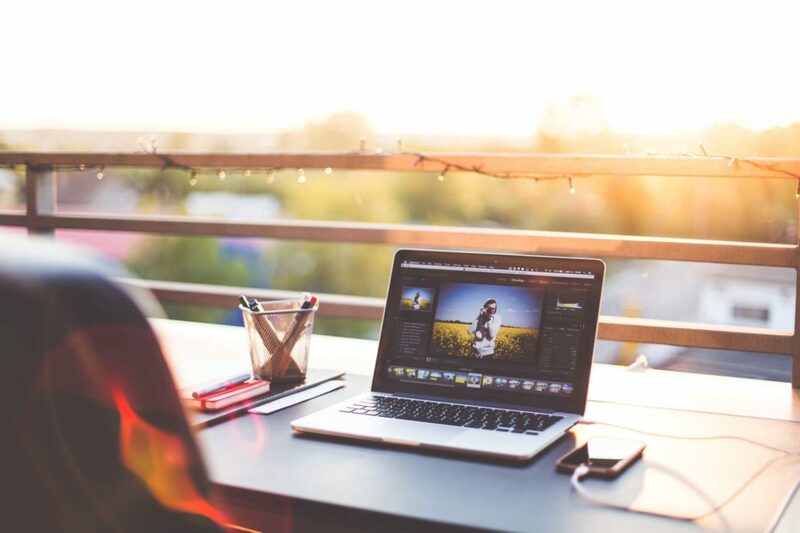 Soundcloud is famous for the service and platform it gives to music makers. Amazon is a bigger name I know you heard of it but it is a bigger name in Music streaming industries too with over 30 million songs. You can also use the prime service it is very cheap so I guess you all can easily afford it. 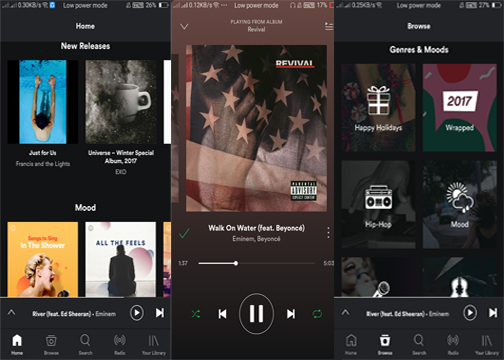 With the versatile playlist and very easy user interface makes it one of the best music streaming app in this list. The user interface of Amazon Prime Music looks so old even we used it for the first time. Talking about the sound quality Prime Music has an excellent sound quality it gives you best quality music to stream and it also doesn’t use much Internet data so you are thinking of purchasing this you are good to go. They provides all kind of song charaterized into verious geners. It superior feature use a little amount of ram so it never overload your processor and your mobile always work well even if the Prime music is working on the background. 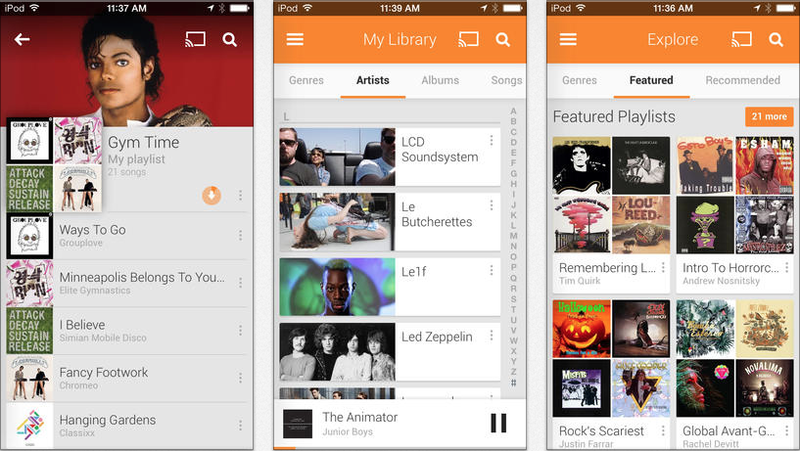 Google Play Music is yet another best free music streaming app which is very popular as it is the product of Google. As a Giant Google has his foot in the music streaming industry too with the Google Play Music. This app is preinstalled on all the Android mobile so that makes it highly versatile. You just have to search the song and enjoy playing it. 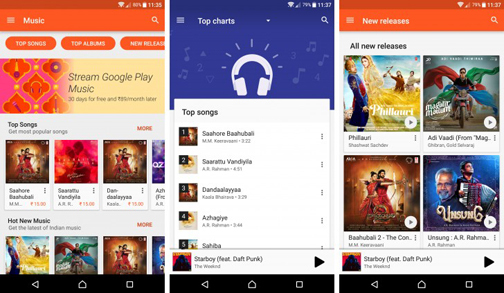 As the Google Play Music is widely popular for delivering English tracks but it rapidly increasing its foot to the Bollywood songs too. Google Play Music provides the best quality audio with little ease of using the processor so you might don’t get in trouble in using the device. 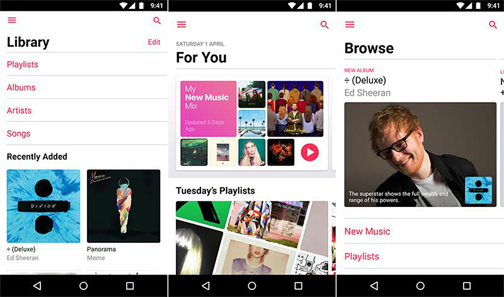 Google is updating his music player to provide the great user experience. Let’s talk about the service it offers, Google plays Music comes with free as well as the paid version the. It is a little different from other music streaming app you can just stream the collection or just search for the song or an album. Deezar is considered as one of the best music streaming app as it provides 40 million songs in a very good sound quality. It provides very customized music as you can find any song in the right place. It also starts creating a playlist according to your songs selections. The thing that makes it a successful music streaming apps as it provides the lyrics also so you can read your favorite song lyrics & memorize it easily. With the help of Deezer, you can share your favorite music with your friend via messenger or any other platform so you don’t need to open any other platform and you can share your music too. And One more thing Deezar has a great User friendly design and provide some good quality music to its users. Saavn is the first app that brings the music streaming trend in India. Saavn provides unlimited free access to music content across all genres and all major regional languages. Saavn’s catalog includes 30 million you can find any Bollywood and western playlist here. This app even provides in-house curated playlists categorized by genre, artist or your mood. There’s also a wide selection of podcasts, radio channels based on drama, mystery, comedy, and sports. 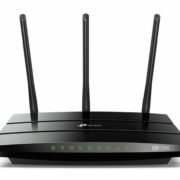 You can play any quality according to your internet speed. It also lets you play your device tracks when you are offline. You can go for a premium package by giving Rs 99 for Android and Rs 120 for ios user. Gaana has a huge collection of Bollywood, International, regional content such as Marathi, Bengali, Rajasthani, Bhojpuri, Malayalam etc. It has a 10 million songs database. You can save your favorite tunes, playlists, albums, and artists in just a click. If you are a radio lover than you love it as it let you stream more than 10 stations provided by Radio Mirchi 98.3 Fm. It also lets you access your local media to play music. Its available on Android, Ios, Windows. 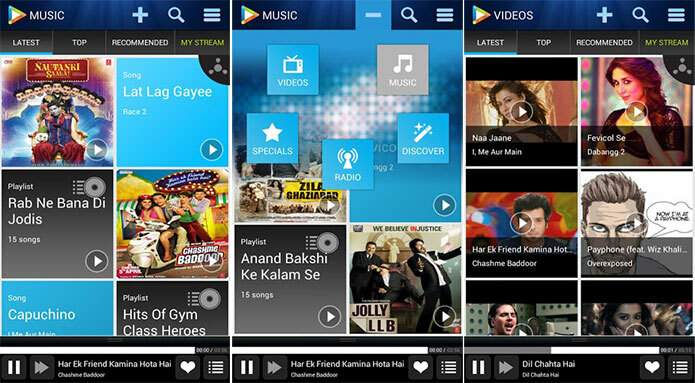 Hungama is music streaming app loved by the Indian audience with over 3.5 million songs another and also videos of Bollywood, Regional and International flavors. 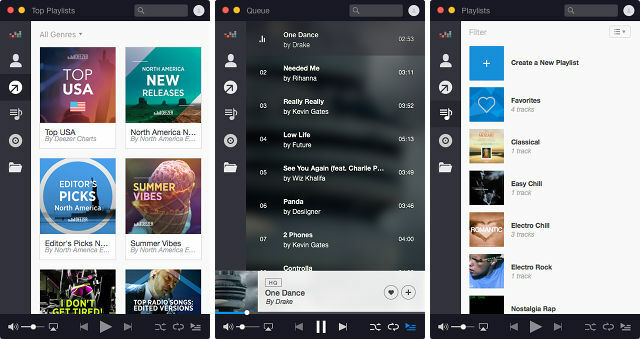 It’s an adaptive music streaming app it can adaptive itself according to your internet speed. You can listen and follow any celebrity and artist playlist and watch music videos and also view lyrics to set up a mini karaoke experience. You can enjoy the unlimited streaming at free but you can buy Hungama premium version at the rate of 99 rs per month for add free, good quality and unlimited download. Hungama is available for android, ios, and windows. 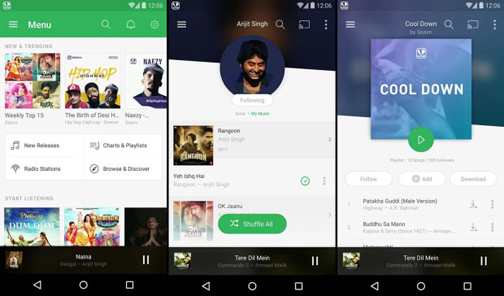 Wynk is a better Bollywood music listening app made by Airtel. Wynk currently hosts up to 3 million songs across Indian and International music. It ensures high-quality music streaming for free on demand. Wynk covers all genres including Bollywood, Pop, Rock, Metal, Bhangra, Devotional, Romantic, party songs etc. It also delves into regional songs from Marathi, Bhojpuri, Rajasthani, Bengali etc. languages. Of course, it also features many curated playlists by moods, artists, genres etc. and an internet radio for hours of uninterrupted music playback. It is available for free as well as paid or premium version. The first-month trial is free but after that, you have to pay a sum of 99 rs per month. It can also be used as a local music player and available on android, ios and windows. Music streaming apps are a relief in now these days if we don’t have a songs collection who cares unless we have the best music streaming apps. In this list of best music streaming apps in India, all the streaming apps are good but we have picked only two apps for our readers. So the picked apps form best music streaming apps in India Is. 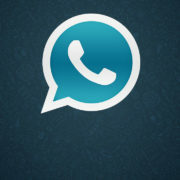 is there any app which allows free offline download too? It’s a nice and quite knowledgeable post.